Fintastic Birthday Card by Larissa Heskett! Here is an adorable birthday card by Larissa using Tranquil Tides and Mermaid Crossings! Just look at that amazing color and dimension on those seahorses! The Tranquil Tides Dies make it so easy to focus on the coloring, and not worry about the cutting! I love the cool circles she used to create the 'porthole' for the shaker card! And as a surprise, it's a DOUBLE shaker! Wow! Thanks so much Larissa for inspiring us today! Please make sure to head over to Larissa's blog, Larissa Heskett Designs to see more details about her work and say hello to her today! 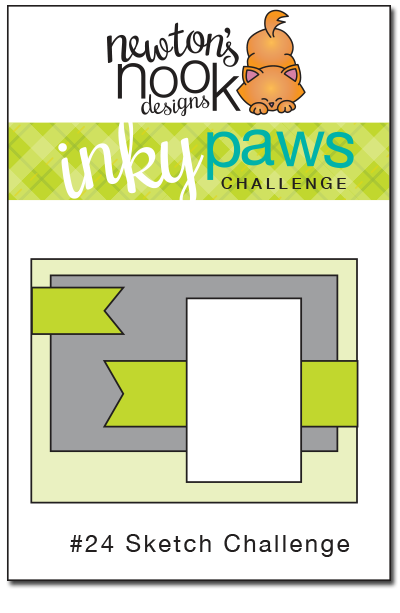 Last Chance to enter our Inky Paws challenge #24 - Sketch Challenge! 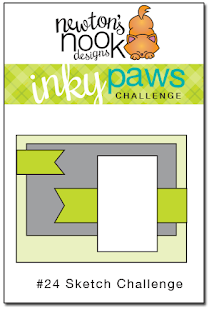 Just a little time left - You have until TONIGHT - Friday, September 4th at Midnight CST time to enter our current inky Paws Challenge. All you need to do is create a card or project with this sketch and use & NND products! Love it! Wonderful coloring on the sea horses. Cute, feels like being at an aquarium! WOW - Larissa did so great on this fun card - wonderful!!! Winston is a Football Star! Hello Fall - Simon Says Stamp EXCLUSIVE set! September release Now Available + WINNERS! September Release - Sneak Peeks!